We're all self-critical—but for teens, self-consciousness is hardwired. Here's how to become aware of the emotions we're courting on social media. How many times a day do you check into your social feeds? How many times do you hit refresh in one visit? Our need to be social can backfire on social media, when we accidentally activate the comparing mind, which is a source of much unhappiness. Of course, this can happen offline, too. But the toll looms larger online, with of all those perfectly curated images of people’s lives inviting us to compare our insides to other people’s projection of their outsides. For teens and tweens, who are actually hardwired for self-consciousness, the constant comparing and curating, which used to end with the final bell of the school day, when kids could go home and put on their sweatpants, is a twenty-four-hour-a-day job. Socializing and social comparison begins first thing in the morning and ends last thing at night. Predictably, psychology research consistently shows that social media is making kids unhappier and more narcissistic. The sheer volume and instant nature of digital media means that when we log in, we are drinking from a fire hose of emotional stimulus. We can be anywhere in the world and be met by friends’ posts that trigger joy, resentment, sadness, laughter, grief, jealousy, and more—all within moments. None of us, adults or children, are wired to take in that much emotional content at once without reacting. Research also reveals that social rewards and punishments feel the same online and off. If someone interacts with us in a positive way online, we get the same neurochemical rewards in our brain as we would in person. When we (or our children) are rejected or ignored online, we get the same feeling of rejection as we would in person. More interestingly, the sense of emotional attack activates the same part of the brain as physical attack does. Emotional pain is just as painful, just as real, as physical pain, whether it comes from the virtual world or not. None of us, adults or children, are wired to take in that much emotional content at once without reacting. So, can we teach ourselves, and the young people around us, to approach social media feeds with mindfulness, even occasionally? Yes, social media is contributing to a new era of adolescent (and adult) social stress, but when we accept that it is here to stay, we can also see it as a new opportunity for connection and mindfulness, if we build it. Mindfulness tells us there is insight to be found in anything when we approach it with mindfulness, and that even includes social media. Find a comfortable, alert, and ready posture. Shrug your shoulders, take a few breaths, and bring awareness to your physical and emotional state in this particular moment. Now open your computer or click on your phone. Before you open up your favorite social media site, consider your intentions and expectations. As you focus on the icon, notice what experiences you have in your mind and body. Why are you about to check this site? What are you hoping to see or not see? How are you going to respond to different kinds of updates you encounter? By checking your social media, are you interested in connecting or in disconnecting and distracting? Close your eyes and focus on your emotional state for three breaths before you begin to engage. Opening your eyes now, look at the first status update or photo, and then sit back and close your eyes again. Notice your response—your emotion. Is it excitement? Boredom? Jealousy? Regret? Fear? How do you experience this emotion in the mind and body? What’s the urge—to read on, to click a response, to share yourself, or something else? Wait a breath or two for the sensations and emotions to fade, or focus on your breath, body, or surrounding sounds. Try this practice with one social media update, or for three or five minutes, depending on your time and your practice. Noticing how social media makes you feel can help you discover how to use it more mindfully. As you become more aware of the emotions you’re actually inviting into your day when you visit social media sites, you’ll be able to make better decisions about how often to visit those sites. And, keep in mind, the science of social media is more complex than we might think. For example, research shows that the more we look at others’ carefully curated social media status, the worse we tend to feel. But, the opposite is also true: if we look back at our own updates, we often see the positive aspects of our life presented and tend to feel better. So consider scrolling through your own updates sometimes, as you look at everyone else’s. Technology does not define us, despite social media trying to put us into categories and reduce us to a series of likes and interests. Examining and changing our own relationship to technology opens the door for us teach through example and to practice new ways of making technology foster community and wellness. This article was adapted from Dr. Christopher Willard’s book Growing Up Mindful. 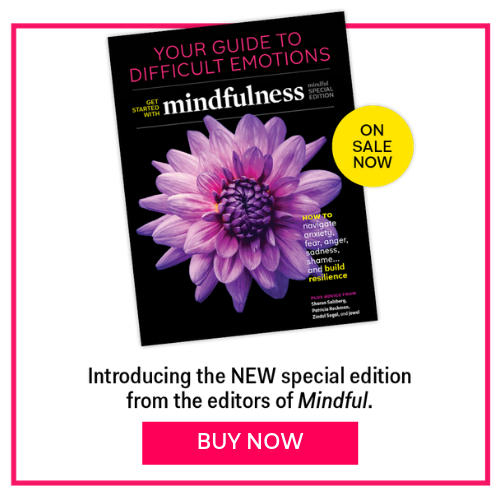 Subscribe to learn more about the best mindfulness practices. Christopher Willard, PsyD, is a psychologist and educational consultant based in Boston, specializing in mindfulness for adolescents and young adults. He has been practicing meditation for over fifteen years. He currently serves on the board of directors at the Institute for Meditation and Psychotherapy and the Mindfulness in Education Network. Dr. Willard has published five books on contemplative practice, including Growing Up Mindful. He teaches at Harvard Medical School.